Part II Bistro on Queen Street, Blyth. The story of how Part II came to be begins abroad. We travelled and worked together in Great Britain for five years, absorbing as much culinary tradition as we could from wherever we found ourselves – always thinking that eventually we could draw from those different culinary experiences and create new, interesting and well presented cuisine in our own venue. 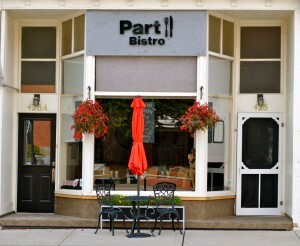 Only when we came back to our home in Blyth, did we realize it was time to open our own bistro…it was time for PART II. Flash forward to 2018: After 7 years of running a successful restaurant in Blyth, we closed the doors on December 15th, 2018. Our Blyth location is now the home of Part II Catering – open for business as of January 2019. Peter is available to cater weddings, events, galas, private parties at your own home and various tastings. Cedric Staehli was a huge part in helping us open our Goderich location; as were several other local people, too numerous to mention. Cedric worked with Peter in the kitchen until he left for Switzerland last year. Wyatt Ducharme, alongside Peter, is at the helm of the kitchen at Part II Bistro Goderich, while Amber Ritchie handles our front of house. They have done a fantastic job of getting the restaurant going and maintaining the high standards we set way back in 2012 in Blyth. Peter, Sarah and Georgia (our 7- soon to be 8- year old daughter).